Contributed Photo. 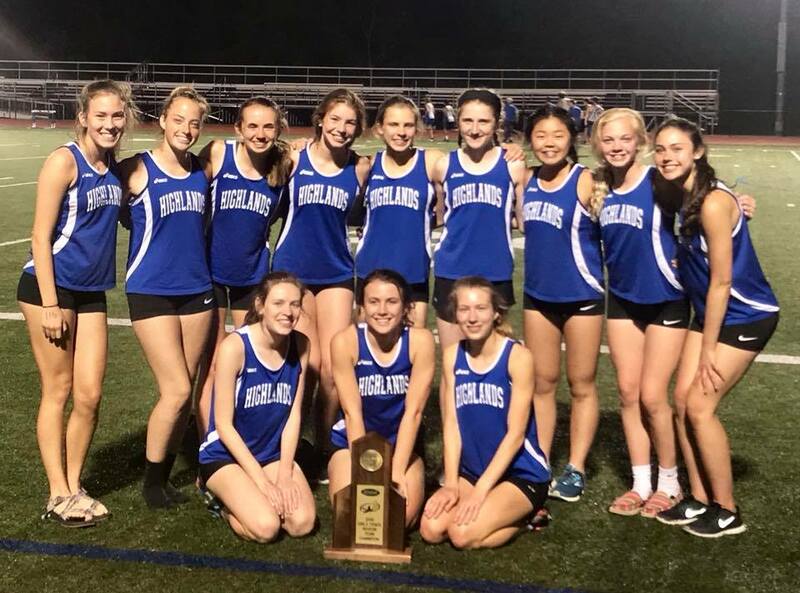 The Highlands Girls Track and Field team captured its sixth region crown in seven years Friday at Scott. PHOTO: Allen Ramsey, DWCPhoto.com. 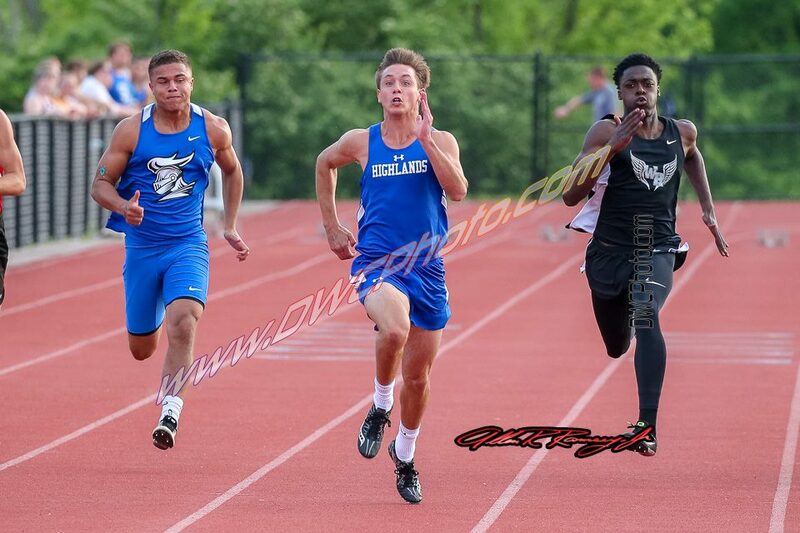 Highlands senior Nick Veneman sprints to a first-place finish in the 100 Meter dash in 10.88 seconds Friday. Veneman scored 30 points individually also winning the 200 and 400 Meter dashes and helped the 800 Meter relay team win gold in the Class 2A, Region 4 meet Friday at Scott. The Highlands Bluebirds baseball team (19-10 overall) had beaten every team it faced in the 9th Region except the Covington Catholic Colonels. The Colonels handed the Bluebirds their only two losses out of 13 games against region opponents. But the third time became the charm as Highlands score four times in the top of the seventh inning to beat CovCath (20-9), 5-2 in Park Hills. The Bluebirds had lost four in a row to the Colonels dating back to a 7-0 Highlands win in the 9th Region quarterfinals on May 30, 2016. "Whenever you get a win against a quality opponent, especially here toward the end of the year when you're getting ready for district and regional play, it's a big deal," said Jeremy Baioni, Highlands Head Coach. "That's a really good team. (CovCath) swings (the bat) really well, (is) solid all the way around. We stuck to the game plan and guys leveled out swings a little bit better. We finally put something together." Highlands managed just six hits, but three went for extra bases. But junior Bryce Ziegler went 2-for-3 with a double and run scored. Senior Hunter Dreves had a huge two-run double in the seventh and senior Tyler Gulley hit a solo home run. CovCath senior Jack Maile pitched into the seventh inning. Maile allowed four earned runs, four hits, struck out five and walked none. Junior Sean Casteel threw the final two outs in the seventh striking out two, but allowing two hits and one earned run. "I think it shows that we just never really give up," said Chris Bridewell, Highlands junior. "We were struggling at first. We managed to get a hold of it in the seventh inning. (Maile) had a weird tail to his fastball. I think it helped seeing him throw to the other guys and talking about it." Senior Drew Rom picked up the win for Highlands. Rom allowed eight hits, two earned runs, walked one and struck out eight. Highlands faces St. Henry at 1 p.m. back at Covington Catholic in the second game of the Coach Conner Classic. 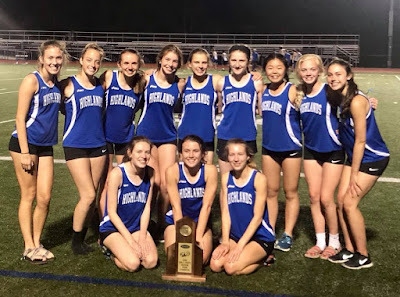 The Highlands girls track and field team won its sixth Class AA, Region 4 championship in seven seasons at Scott on Friday. Highlands scored 158.33 points running away from the competition. Bourbon County finished second with 96.66 points. The Highlands boys finished second with 119.5 points. Lexington Catholic won the boys side with 151 points. On the girls side, sophomore Maria Broering broke a school record running the mile in 5:15.89. Broering also helped the two-mile relay team win gold in 9:50.41. Seniors Savannah Brady, Karsen Hunter and freshman Maggie Schroeder were the other runners. Seventh grader Alyssa Harris took third in the mile in 5:23.61. Brady won the 800 in 2:18.54 and Schroeder won the two-mile in 11:48.23. Sophomore Adriana Muntaner won both hurdles events. She won the 100 hurdles in 15.83 seconds and the 300 in 47.56. Muntaner helped Highlands to two second-place relay finishes in the 400 in 52.43 and the mile relay in 4:12.31. Her teammates in the 400 were senior Sophie Steppe, junior Karli Baioni and eighth grader Emmie Brewer. The other three runners in the mile relay were Steppe, Brady and Broering. Baioni finished third in the 100 hurdles in 17.42. Baioni and Steppe also helped Highlands to a second-place finish in the 800 relay in 1:51.46. The other two runners were Brewer and freshman Bella Workman. Steppe also won the 400 in one minute, .64 seconds. Highlands senior Mary Claire Redden recorded two victories. She won the shot put with a throw of 32 feet, 8.25 inches and the discus firing a 106-04. Highlands senior Nick Veneman had a monster day on the boys side. Veneman set a new school record in the 100 Meter dash in 10.88 seconds. He'd previously ran it in 11.17 10 days ago. "All the workouts helped out over all four years. What made the most difference was really this week at practice, I learned how to get my start even better," Veneman said. "It's mostly just mechanics and learning the first couple steps that I needed to take and what I needed to do with my arms with each stride." Veneman won the 200 in 22.29 and the 400 dash in 49.41. Veneman also helped the 800 Meter relay team to a top finish in one minute, 33.05 seconds. The other members of the squad are senior Cole Kendall, junior Liam Ehrman and sophomore Sawyer Depp. Highlands won the 400 relay in 44.88 seconds. The runners were Kendall, Depp, Ehrman and senior Jack Schultz. Senior Garrison Herfel placed second in the 100 hurdles. His time was 18.36 seconds. Senior Michael Dunn finished second in the discus throwing a 48-07.75 and senior Carl Schoellman finished second in the pole vault at nine feet even. The Class 2A state track and field meet will be May 18 at the University of Kentucky Outdoor Track and Field Complex. The meet starts at 2 p.m. The Bluebirds (12-9 overall) lost their first 9th Region game of the season in eight games at Winkler Field. Ryle broke the game open with 11 runs in the top of the fourth to go up 14-2. The Lady Raiders (15-5) outhit Highlands, 11-4. Ryle had four errors to three for Highlands. "The last two days, we've been in kind of a funk," said Rob Coffey, Highlands Head Coach. "We have to figure out how to turn that around. One of the things we tell the players as coaches is the coaches can't motivate you every day. That's not the coaches job to motivate you. You're supposed to come to the ballpark motivated and ready to play. We haven't done that in the past two days. If you don't come ready to play, this is what happens." University of Kentucky commit Maclai Branson had three runs batted in on a home run and a double to lead Ryle. Pitcher Hannah Bishop added three RBI on two hits and struck out three. Highlands junior Rachel Gabbard had two hits and a run batted in. Sophomore Piper Macke had a two-run single in the fourth inning and senior Ella Grimm had a double. Highlands plays twice Saturday at Dixie Heights. The Bluebirds face Oldham County at 12:30 p.m. and the host Lady Colonels at 3 p.m.